Please read, really actually read, these statistics. 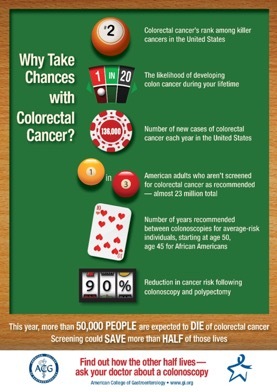 Then read below to learn more about how you can reduce your risk of colon cancer right now! WHAT CAN YOU DO NOW TO DECREASE YOUR RISK OF COLON CANCER? If you are over 50, get a colonoscopy (age 45 per the American Cancer Society recommendations). If you have a family history of colon polyps or colon cancer in a close relative, start at age 40. If you don’t know your family history, ask. If your family members haven’t had their colonoscopies, bug them. If you are African-American, start at age 45. If there are any concerning symptoms or changes, come and get it checked out sooner. If you have already had a colonoscopy, make sure you know when you are due for your next one. Decrease your intake of red meat and processed meat (like hot dogs and sausages). Decrease your intake of refined carbohydrates (like white flour, white bread, white rice, pastries, sodas, snacks, pasta, sweets, breakfast cereals and added sugars). Try to encourage a healthy gut microbiome with a high fiber diet, especially with prebiotic fiber sources. Prebiotics are foods that act as nourishment for human microflora. Prebiotics are used with the intention of improving the balance of these microorganisms. A healthy gut microbiome may help reduce your risk of colon cancer. Knowing your family history of colon polyps and colon cancer is incredibly important in determining what age you should start screening examinations and how frequently you should be coming. 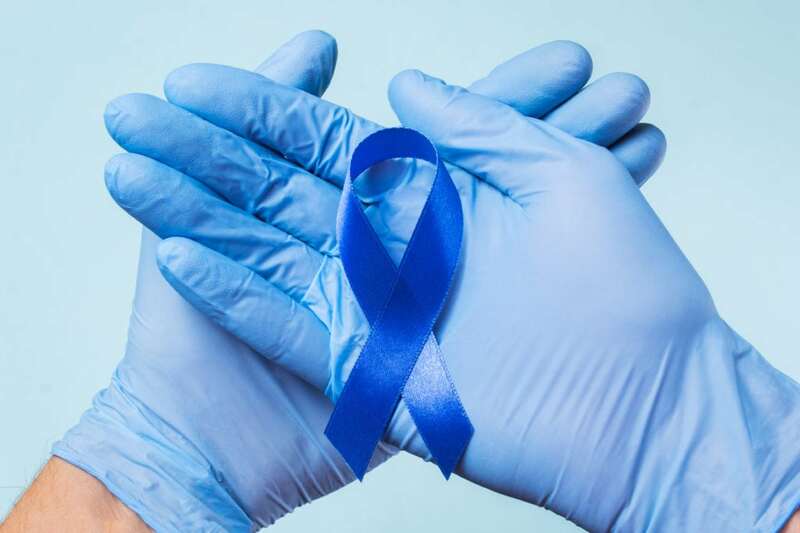 Also, “gentle” prodding of your loved ones to encourage them to get caught up with colon cancer screening recommendations can be a highly effective motivator. So, ask your sibling how old they were when they were diagnosed with their first polyp and remind your parent that they are overdue for their surveillance exam – pass along the gift of health and wellness! WHO DO I SEE IF I HAVE SYMPTOMS OR NEED TO MAKE AN APPOINTMENT FOR COLON CANCER SCREENING? You’ll want to make an appointment with a gastroenterologist, someone who specialized in colon cancer screening options. If you’re in the Chicagoland area, feel free to check us out at Comprehensive Gastrointestinal Health. We take a comprehensive approach, meaning we have a team of professionals including a gastroenterologist and nurse practitioner, a registered dietitian nutritionist, and a behavioral coach/counselor all on staff. We all work together to assess your symptoms and to recommend treatment options. We can help determine if it is time for colon cancer screening or surveillance and we can perform colonoscopies in our brand-new deluxe endoscopy suite. Through the support of our dietitian and/or our Comprehensive Weight Management Program we can help to reduce your risk of colon polyps and colon cancer.